I picked up the Steam early access of Mercenary Kings last week and have been very happy with Tribute Games latest shoot fest. Since the game is an early access release it lacks some of the features and polish that it will showcase when it reaches its final launch. That said, the game is very playable and very fun. 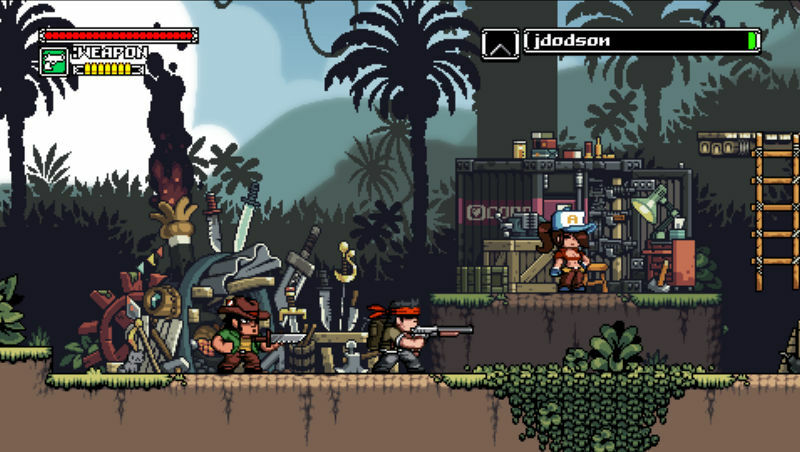 Mercenary Kings is a 2D side-scrolling shooter in the style of Metal Slug. You start at your home base and from there can go on missions, craft guns, purchase items, form multi-player teams and more. The aspects of the early access version that shine for me are the gun crafting and missions. During each mission you kill a swath of bad guys. Randomly these bad... Read All I picked up the Steam early access of Mercenary Kings last week and have been very happy with Tribute Games latest shoot fest. Since the game is an early access release it lacks some of the features and polish that it will showcase when it reaches its final launch. That said, the game is very playable and very fun. During each mission you kill a swath of bad guys. Randomly these bad guys drop loot such as lead, polymer or acid. You can use these drops to craft gun components. You can use the components to make a gun build that suits your fancy. This is a cool feature because instead of crafting a gun and then scrapping it for another one later, you can just rebuild your gun to meet your new specs. So if you want a pistol with 80 rounds one mission and a shotgun the next you can do that. The missions are fun and offer some nice variety. As you complete the missions under your current level sometimes you unlock other missions where you go back to a particular level to accomplish another task. One feature I really liked was the ability to go back and replay a mission as many times as you want. I found that useful for collecting cash and resources to craft certain gun components I wanted before tackling harder levels. So far, I have run up to one boss and it was very fun. All told it wasn't too difficult, but it was the first boss I found and I am still a low level. Right now the only controls supported are with a USB controller and I believe the best support is through the 360 controller. I recently read a blog post that mentioned keyboard support is coming in a patch soon so if you are keyboard bound it won't be a problem for long. If you are looking for a great retro flavored 2d side scrolling shooter with a few rough edges, I heartily recommend Mercenary Kings. "The Mercenary Kings have been activated... Early! On July 22nd, get the game on Steam Early Access! Help the mission by giving us your intel before the official release! Enter the fray as the most skilled mercenaries on Earth! Craft your arsenal to avenge your fallen comrades and save the world from the fearsome forces of CLAW. Available July 22nd on Steam Early Access at 25% off! " I am very excited to hear that Mercenary Kings will be released July 22nd on Steam Early Access. Everyone that missed the Kickstarter but wanted to check this game will be able to this month! If you are going to pick it up on the Steam Early Access launch, I have created a Cheerful Ghost... Read All "The Mercenary Kings have been activated... Early! On July 22nd, get the game on Steam Early Access! Help the mission by giving us your intel before the official release! Enter the fray as the most skilled mercenaries on Earth! Craft your arsenal to avenge your fallen comrades and save the world from the fearsome forces of CLAW. I am very excited to hear that Mercenary Kings will be released July 22nd on Steam Early Access. Everyone that missed the Kickstarter but wanted to check this game will be able to this month! If you are going to pick it up on the Steam Early Access launch, I have created a Cheerful Ghost event you can join to put on your calendar. You can pre-order the game on the Mercenary Kings website. Anyone else going to pick this up when it launches on July 22nd? Mercenary Kings is a neat looking Metal Slug styled shooter that was funded on Kickstart last year I totally missed. The game is being made by Tribute, the awesome team that brought us Wizorb and is currently in the closed Steam beta for Kickstarter backers. The video above shows off the shooting, missions and crafting that makes Mercenary Kings unique. The game also boasts 4 player local co-op something I plan on trying out with my friends. If you played Metal Slug in the arcade, like me, you might love this franchise. The last new Metal Slug was in 2009 and it seems that now its just re-released on systems in various forms. I picked it up the Metal Slug anthology on... Read All Mercenary Kings is a neat looking Metal Slug styled shooter that was funded on Kickstart last year I totally missed. The game is being made by Tribute, the awesome team that brought us Wizorb and is currently in the closed Steam beta for Kickstarter backers. If you played Metal Slug in the arcade, like me, you might love this franchise. The last new Metal Slug was in 2009 and it seems that now its just re-released on systems in various forms. I picked it up the Metal Slug anthology on the Wii and whereas the games are awesome, the translation and controls were not. Getting a __GREAT__ version of this awesome style of game on PC is very interesting to me. According to Tribute, the game will initially come to PC followed by a Mac and Ouya port. They did say that a Linux port is possible and would be released on Steam if it was made. When a formal release date is announced, I will let you know.